What is Digital Loan via mCash? 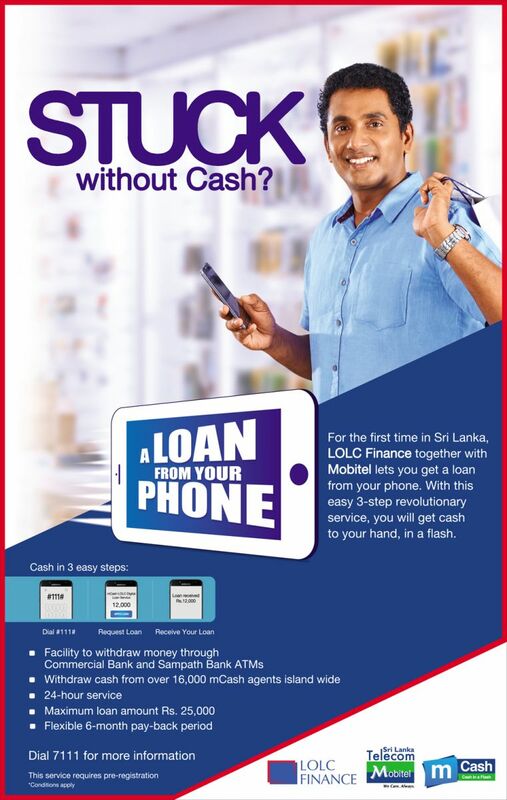 Digital Loan via mCash is a product that enables mCash customers to obtain micro loans with a short term repayment period through LOLC finance. What are the benefits of Digital Loan via mCash? Who are allowed to obtain a Digital Loan via mCash? Basic and Enhanced mCash customers are allowed to access this service. How to obtain a Digital Loan via mCash? Before Applying for a Loan it is a must that the Customer should Check Eligibility for the Loan. Once the Customer is confirmed on the Eligibility for the Loan based on the maximum loan amounts the Customer can Apply for a Loan. Check Eligibility: This is the instance where the customer is reviewed on his eligibility. A confirmation SMS will be sent to Customer instantly on the Eligibility. Apply Loan: This is the instance where the customer will be applying for the loan based on the eligibility confirmation. Upon successfully registering with LOLC Finance the approved Loan amount will be sent to the Customer mCash Account. How can a customer check his loan outstanding and Overdue Outstanding? How can a customer pay his outstanding before the loan period? Can a customer apply for a loan without checking eligibility? Can a customer request for a loan amount below the approved loan amount? Yes, the customer can request for a loan amount below or equal to the approved loan amount but the minimum loan amount is Rs 5,000. What is the interest rate for the digital loan obtained? One Month: No interest rate but a 5% service and Rs 100 collection will be charged. What happens if the customer dose not settle the loan within the period? A penalty fee will be charged for every installment delayed, and there after until a considerable amount of months LOLC will try to retrieve the amount via the balance remaining in the customers mCash Account. If the amount cannot be recovered by the above mechanism, the LOLC recovery team will physically visit the customer location and recover the amount. What is the penalty fee charged from LOLC? How does the Customer repay the Loan Installment? Automatically upon receiving the Loan amount to the mCash Account, a Standing Order will be created to the due date. Will the standing order option expire? No, the standing order will be scheduled until the loan is fully settled. What is the correct format to enter the NIC? Capital “V” or “X”, if the customer enters a simple “v” or “x” the request will be rejected. Can another loan be applied while an existing loan is active? No, another loan cannot be obtained while an existing loan is active. What can be done with the granted loan via mCash? Where can Customer withdraw mCash? What are maximum Withdrawal Per Transaction Limits? What are maximum Loan Disbursement Limits for mCash Account Types? Is the Customer charged for Loan Withdrawal? Will the customer have to sign a loan agreement every time he applies for a loan? No, a loan agreement signed initially is valid for 2 years. Upon the completion of 2 years, another agreement will need to be signed.